The Infinix Hot Note X551 Dual SIM is an incredible device with a seamless design and advanced features that are certainly going to fill your life with fun. Click images, play games, watch movies, and keep yourself connected with this Infinix smartphone. Equipped with the Android KitKat operating system, this phone provides you access to a broad range of applications and games that you can download from the Play Store. It also provides you with an easy to use interface and puts all the essential features within easy reach. With the help of 1.4GHz MediaTek Octa Core processor, phone is fit to do multitasking without any glitches. This device supports dual SIM cards. As a result, you can use two separate SIM cards at the same time for enjoying the plans and benefits of two different network providers. The phone comes with a 5.5inch HD capacitive touchscreen, which offers a totally mesmerizing visual experience. The 8MP primary camera of this phone lets you click high resolution images. In addition, its 2MP front camera not only facilitates video chatting with your friends and family but also enables you to capture stunning selfies at a wide angle. The phone comes with 1GB RAM, which is meant to boost the processing efficiency. Now you can quickly and seamlessly play and enjoy all your videos, audios, and other necessary files. It enables the smartphone to read and write the data in the same time frame. This Infinix smartphone comes with 16GB of internal memory. So be it your essential documents, songs, music, or your favorite movies, you can keep them saved over your phone and can easily access them on the go. With the built in 3G and WiFi function, this phone enables you to connect to the Internet wirelessly. With the 4000mAh battery, you get an extended talk time as well as application usage time. The copper brown color along with its sophisticated design makes this device stunning and attractive. The Infinix Hot Note X551 features a massive 5.5inch HD capacitive display that enhances your viewing experience. You can quickly navigate through different applications on this screen. It provides excellent color richness and contrast that makes images look alive on your mobile screen. The screen can display images with high HD resolution of 720 x 1280 pixels. Even though the device has a large battery, it is one of the slimmest and lightest devices in its category, with a body weight of 172g and thickness of 8.9mm. The copper brown color and premium finishing with metallic texture makes this device a complete star. 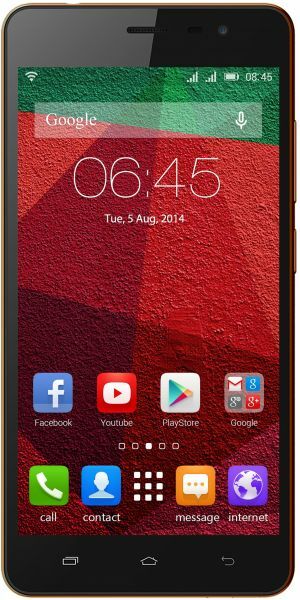 This smartphone comes with 1.4GHz Mediate Octa Core processor that delivers powerful and consistent performance. Its 1GB RAM combines with the processor to provide a seamless web browsing experience and enables you to multitask without facing any time lag. You can run a range of Android applications on this device as it is equipped with the Android 4.4 KitKat operating system that enables you to download endless applications to sync with your lifestyle. With the 8MP rear camera of this device, you can capture beautiful memories effortlessly. It is integrated with an OV8865 image sensor that helps provide an efficient performance. This camera enables you to record HD videos at 30fps. For selfie lovers, this phone features a 2MP front camera, which supports 75 percent wide angle shooting for easy recording of pictures. Apart from this, the device supports different music formats like MP3, AMR, and WAV so that you can listen to all your favorite feet tapping songs of different genres anytime anywhere. A range of sensors such as the proximity sensor, G sensor, light sensor, and Hall sensor come equipped with this device. The Infinix Hot Note X551 is WiFi, 3G, and 2G enabled. You can make video calls, share images, documents and more with your friends almost instantly on this smartphone. It also has Bluetooth 4.0 connectivity, through which you can transfer data to other Bluetooth enabled devices. The USB 2.0 port of this phone enables you to connect with laptops and computers very quickly. Its dual SIM card feature provides you with convenience of use. Powered by a 4000mAH lithium polymer battery, this device provides you with an extensive runtime even with heavy app usage. The smartphone provides you with a usage of 21 hours of talk time on 3G, up to 8 hours of video playback, 40 hours of music playback, and 6.3 hours of Internet surfing. Along with this, the battery gives you a standby time of 600 hours. Equipped with an internal memory of 16GB, this phone enables you to store an enormous amount of images, videos, movies, games and other files in it. Make the most out of professional and recreational applications with this excellent memory. 96.4% of users recommend this product to a friend. Great product for such a cheap price. Battery life is awesome. Go for it... and you can also give it as gift to your fellows without being guilty. The cover sold separately is also good & phone looks much costly with cover on! Haven't tried screen protector yet (wasn't available for long!!! ), but you must have it since first usage, because otherwise screen gets some scratches even with GENTLE TOUCH of a TISSUE PAPER!!! (well that was surprising!!). Could have done with sound on front side and higher sound level through speakers!